The Delhi Development Authority has started the document verification camp for all the winners of DDA Housing Scheme 2014. The document verification camp date confirmed by the official and also published on several other news website. DDA document verification camp dates is now confirmed for varied location of Delhi namely Narela, Rohini, Mukherjee Nagar, Jasola, Sirsapur and other location of Delhi. As the draw result was announced on 25th November 2014 now DDA sending the allotment letters to successful applicant’s correspondence addresses. In case applicants not received the allotment letter on mentioned address can get it from the DDA head office while they visit for the document verification. 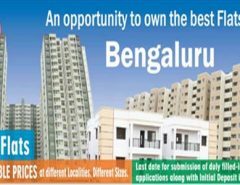 DDA document camp is started from 1st of January 2015 and will continue till 31st January 2015 all the applicants who won the flat can visit the DDA head office INA with the required documents for the verification. So, if you are outside from Delhi and want to book your ticket can do it before 31st and can visit DDA office for document verification. All the applicants of Dwarka sector 23b no need to visit again for the document verification as special camp for Dwarka applicants already held in the month of December 2014 still if any applicants missed any document they can send it via post. The possession of the flat is also giving to successful applicants from 1st of January. 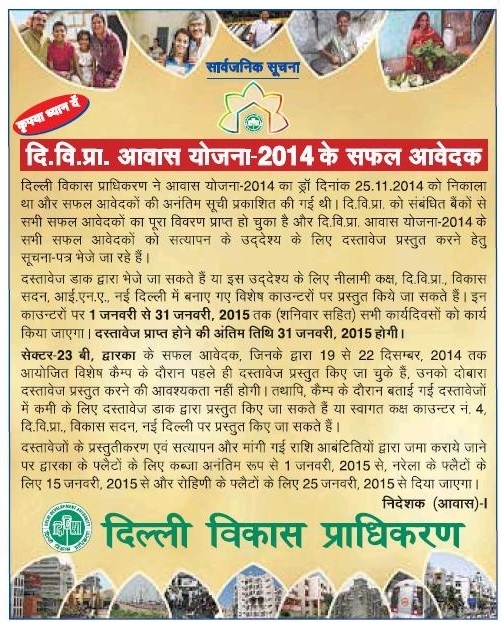 Applicants who verified the documents and submitted the required money can get the possession of flat, Dwarka applicants get possession from 1st of January 2015, Narela’s applicants can get the possession from 15th of January & applicants from Rohini can get the possession of flat from 25th of January 2015. I have already mentioned the list of documents required for the verification going to publish once again here for you. So that, you don’t need to visit other pages. Counter Foil/Acknowledgement of application form of DDA Housing Scheme-2014,(in original). Photo and signature, dully attested, by the Gazetted Officer (in original). Copy of bank account passbook/bank statement dully attested by the bank manager from which the allotment money has been paid along with payment proof. An affidavit declaring that “I or my wife/husband or my dependent (including minor children) do not own in full or part on Freehold or Lease Hold basis any residential plot or house in the Urban area of Delhi, New Delhi or Delhi Cantt” (in original). Details of Income Tax Ward/Circle where Income Tax Return is filed by the Applicant. Below is the important notification for all successful applicants regarding the 1 -31 January 2015 DDA Document Verification Camp. When I Will Receive my Refund From DDA? not get any letter from DDA. You can get it from DDA office while visit for document verification.